Hi everyone! The apartment inspection is done. Yeah! I had to laugh at the comment that I needed a larger crafting area. Anyway my reward for all my hard work was to take some time to play just for the fun of it. I decided to try some stenciling techniques and wasn't sure what I was going use as an image. Then I remembered I had a teapot stamp and sentiment that had never been used. I decided to create a pocket which would hold a tea bag on the card. The base panel was an experiment. It came out being more shabby than I had planned but I decided to go ahead and use it. I don't know if my results was the brand of molding paste I used or whether I didn't put it on heavy enough. Anyway after running the panel through the laminator after the paste was dry with a foil transfer sheet this was the result. The panel the sentiment is stamped on and the teapot is on was another stencil play which didn't work out. I don't know if the paint dried too quickly or if my wipe was too dry to pick up the paint. Still I like how it turned out. 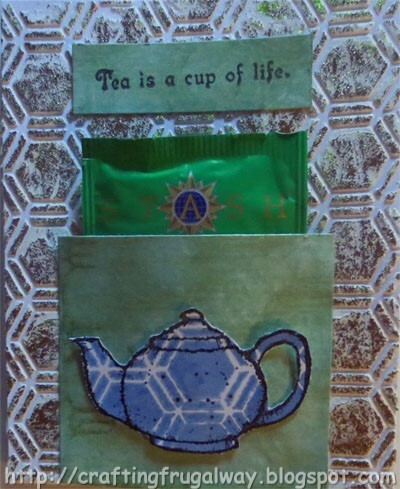 The teapot paper was made by using paint with a cosmetic sponge. Who says you need to spend money on papers when you can create your own. Beware though as it can become addictive. Do you use stencils? If so do you have a go to stencil? I hope my sister will enjoy her tea. It will be a nice surprise to have a card like this in the mail. Need to get back to work because although my "playroom" passed inspection I have a lot of re-organizing and purging to do. I did send a care package of some of my stamps and things I knew I would probably never use again. Thank you for stopping by. Do come back as the first of the month I plan to have some challenge entries ready and posted. Wishing you Happy Frugal Crafting till we meet again! Hi everyone it is with a heavy heart I share my last Just For Fun project for the design team but all good things must come to an end. However I will be entering their challenges. 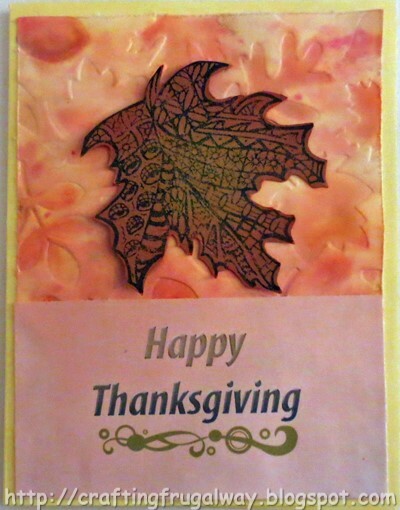 I decided to do a Thanksgiving card using once again the Stamptangle Maple Leaf. I stamped my leaf on Kraft card stock. Then used a cosmetic sponge to apply pan chalk. The cosmetic sponge gives a deeper coloring than using a cotton ball. If you are into using pan chalks you will have to experiment. I decided to leave a border when I cut out the leaf. Usually when I hand cut I try to cut on the line. I love how my debossed background turned out using distress ink pads and an embossing folder. It is always a surprise when the embossing folder is opened. For this piece I directly stamped with the ink pads using Straw,Mandarin Orange, and Vintage. I stamped on the raised side of the folder. 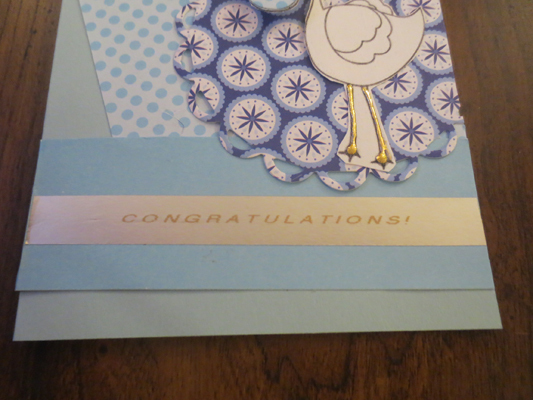 Then I sprayed yellow cardstock with water and embossed like usual. Keep in mind your results will be different depending on which side of the folder you stamp on. Also keep in mind that in places the cardstock color will show. If you don't like how it turned out don't be so hasty to throw it out. You can always cut it in strips to use as a border, in shapes, etc. The sentiment was done in PhotoShop and then I printed it out. I haven't really played with PhotoShop much lately so it was fun to do some playing. That's all folks. 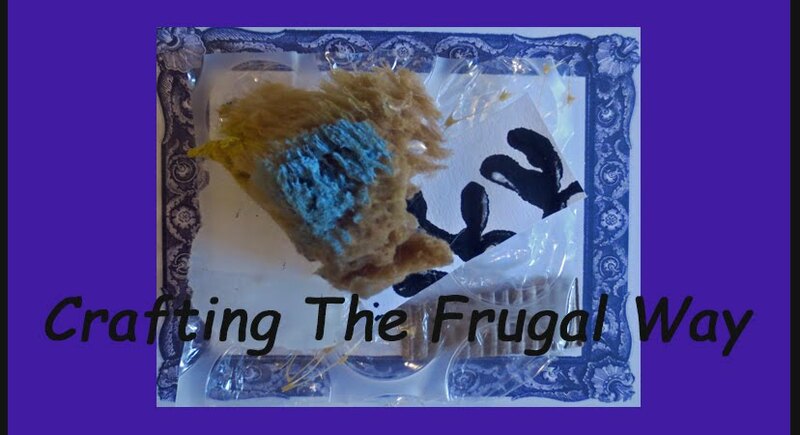 Wishing you Happy Frugal Crafting. Also reminding you that you still have time to enter the Just For Fun Fall Challenge. Hi everyone I've had sitting in my cupboard these empty square jars which olives came in. I decided while waiting for management to come to do the annual inspection I would start work on one to transform. Anyway this is now on a shelf. I will do the other jar now that they have come and gone.. I'also decided to glue raffia on the top part of the jar that I already had. My outdoor Mod Podge was all dried up but I have some Vintage Mod Podge which I have had for almost two decades so I used that to glue the leaves on the jar. I bought the fabric leaves at a Dollar store about five years ago and although I keep using them they came in a good size package with lots of them. *Sigh* I haven't seen any since. 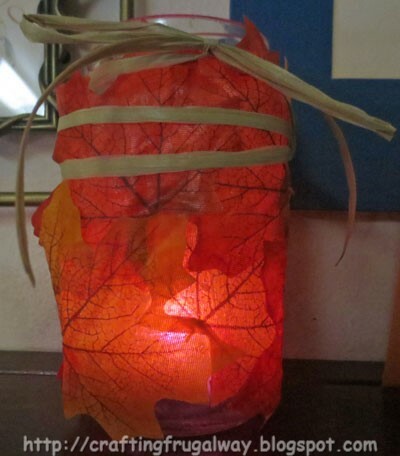 However, I'm sure you may be able to find the leaves at a craft or even a fabric store like Jo-Ann. Then I put a flameless tea light in it. This one you have to blow to turn on and blow to turn out. Wouldn't be good for outdoor as the wind would be turning them on and off. LOL! Of course you could use regular candles. That is all for now. 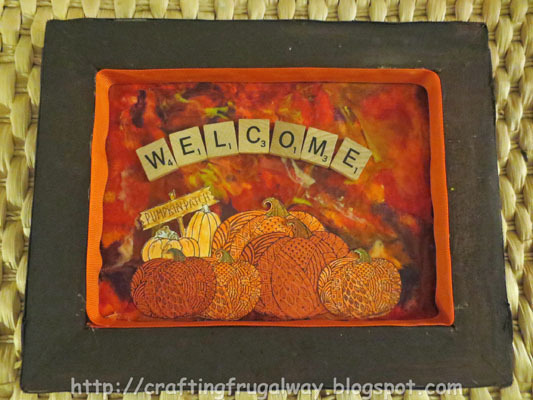 Wishing you a Happy Fall as well as Happy Frugal Crafting till we meet again! Hi everyone I decided today to share a card I made for the September High Hope Stamps challenge. So far I don't own any High Hope stamps so I'm hoping that maybe I'll win one. A gal can always have high hopes. Luckily High Hope has a digi stamp they offer so that even if you don't have one of their stamps you can join in a challenge. I used the sketch which is on the challenge page. It was fun looking through my stash of papers to come up with papers to use. I started by printing the stork out on white card stock. Then I use foil adhesive on the beak and legs. Then foiled those places with a scrap of foil. 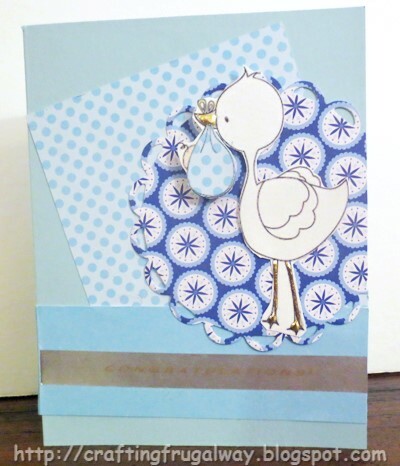 I also printed the stork out on the dot card stock and cut out the blanket part and adhered over the white blanket. The baby was colored with a color pencil. I put a dimensional dot under the baby to pop it up. I used the same dotted card stock for my rectangle. The scallop circle was cut from a piece of Studio G card stock in my stash. I cut a strip from the dot card stock which is double sided with solid on one side. I printed using my Brother label maker with Silver Satin tape the sentiment. Hi everyone I thought it would be fun to do a flashback Wednesday. Especially now that the leaves have begun to fall. Here is a post I did back in October of 2012. Lol! I had forgot of some of these ideas I had. I must confess I still have this card as for some reason I just can't let it go yet. Here is the card I made using my practice leaf print. It isn't perfect but I like it. Hi everyone I forgot to schedule a post for this project. My excuse is my laptop got broken and I was using my old desktop which is so ancient it has the Vista operating system and is so slow. This month the Just For Fun Rubber Stamp challenge is Fall with the option of being anything but a card. 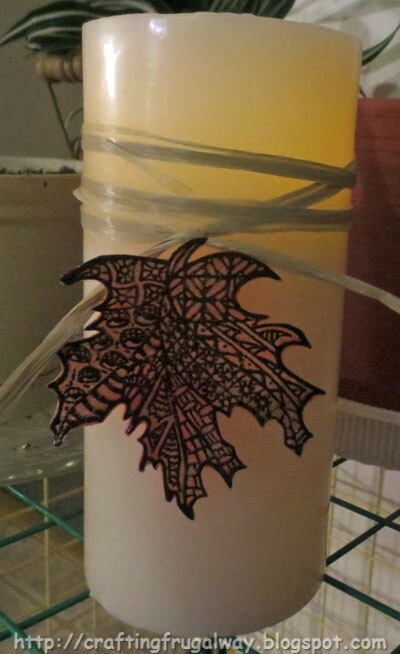 I decided to go along with optional challenge to create this quick flame-less candle. I love the Just For Fun Stamptangle Maple Leaf stamp. I stamped the leaf using black embossing powder on white card stock. Then I spritzed my card stock with water and sprinkled red and yellow Brusho Colour Crystals. I then brushed copper watercolor paint over blending in the colors more. Alas I could not get the subtle sheen to show in the photo. I found that multi purpose glue worked best for adhering things to the candle. I had tried to place a sentiment using my tape runner and it didn't stick. I then decided that the sentiment was too much. Since I glued the leaf to the raffia ribbon and just a drop on the tip of the leaf it will be easy to change for another season. Especially since the multi purpose glue I use quickly rubs off. Thank you for stopping by and do come back as I'm working on some other projects now that I have my "playroom" cleaned up. Wishing you Happy Frugal crafting till we meet again. Hi everyone. The new design team for the next six months has not been chosen yet since there were so many applications. That being the case I volunteered to go ahead and do an inspirational piece for the challenge. The theme is Fall and Not A Card is optional. Being that I need to challenge myself. I went with not making a card. I found this canvas at a thrift store. The writing had bled through clear to the front which is probably why it was under a dollar. Having seen some interesting artwork done using the back of the canvas I decided to see what I could do. Lol! I hope I didn't obliterate some famous person's writing. This project was a learning experience. I should have painted the canvas first to cover the writing. Since I didn't I ended up melting more layers of crayons to cover the writing that was showing through. I used a heat gun this time. You could also use an old blow dryer but it will take longer. I discovered if the crayon was not touching the canvas it splattered all over the place. Until the crayon became too short I was able to have the pointed end on the canvas and draw with the melted wax. I suppose I could have held the shorter crayon with something and continued melting. It worked really well holding the crayon down on the canvas with my wooden handled metal palette knife. A few times I heated the melted crayon already on the canvas and moving the canvas allowed the wax to move. Be careful as the canvas will get hot as you are doing this. Also the Dollar Tree crayons had a tendency to smoke so I did set the smoke detector off after working for about 30 minutes. I suggest doing this in short segments if you are covering a large area. I stamped the medium and large Stamptangle pumpkins on pattern card stock. I only colored the stems with color pencils. The Pumpkin Patch was stamped on a scrap of white card stock and colored with pencils also. I decided to use Scrabble letters for the Welcome part. I found the Scrabble game at a thrift store but they are getting harder to find at thrift stores. I used Tombow Multi-Purpose liquid glue to adhere the wooden pieces and my stamped images. So far they are not coming off. Using my hot glue gun I glued orange grosgrain ribbon inside the frame. 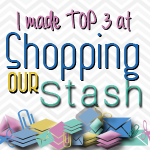 I had just enough in my stash for this project so on my list will go picking up more of the orange ribbon. 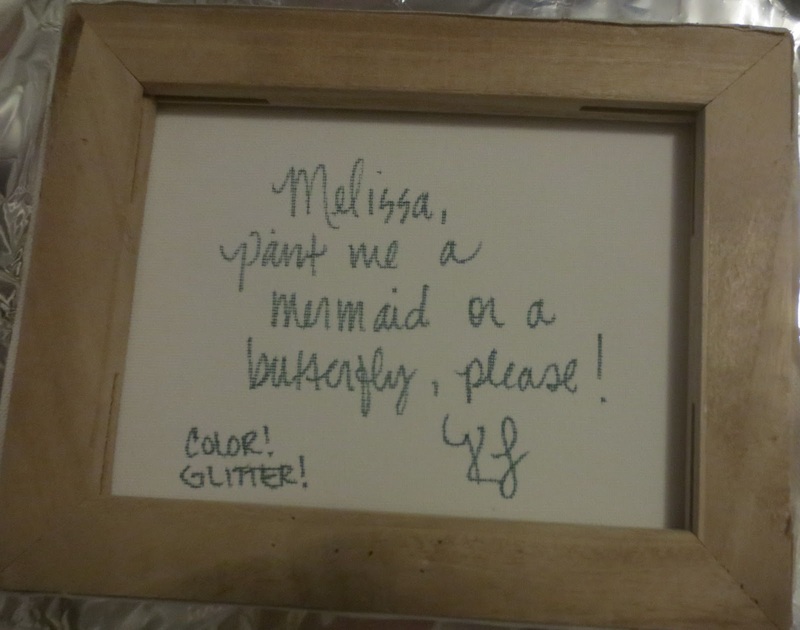 The frame was painted using an unopened bottle of DecoArt paint I found at a thrift store for under a dollar. You do have to know your prices as sometimes I have seen paint priced which I would have paid the same price somewhere else. The final step in this project was to glue magnet strips on the back of my masterpiece. Alas for some reason the strips do not adhere tight with the adhesive that is coated on the magnet. As well as it has a tendency to curl unless I put something heavy on it while the glue is drying. And here it is finally hanging on my front metal door. I like the rustic look and it is already bringing a smile to my face when I enter my apartment. 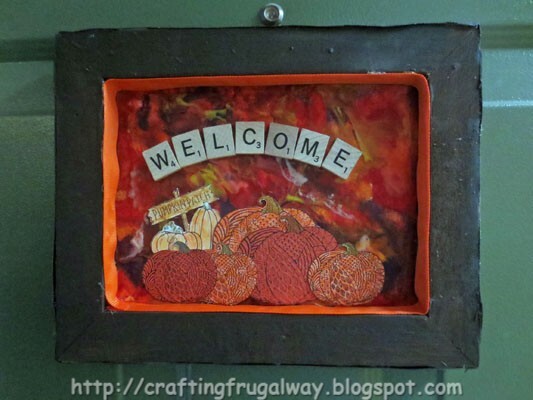 Wishing you Happy Frugal Crafting till we meet again and Happy Fall!